Yesterday afternoon on Hardball, Lowey said that the Peace Corps would get the full $450 million. There then for a precious moment was the alchemy of the impossible transformed into the possible. This morning in the markup of the bill, Lowey kept her word and she too deserves great credit for political courage. This was done in a tiny room in the Capitol, and I could not get in. But former Senator Harris Wofford has privileges and he was there. "Before Lowey started the meeting I thanked her warmly and she enthusiastically talked about her support of the Peace Corps over the years," Wofford emailed me. "Then in the markup she made the case for the $450 million on the way to doubling the PC; the ranking Republican member Kay Granger of Texas graciously supported the whole bill and included endorsement of the funds for the Peace Corps and senior Republican Rep. from Calif., Jerry Lewis spoke about his long support and how once he invited PC Director Loret Miller Ruppe to bring him a plan to double the Peace Corps. It was a love fest meeting." It was not only a love fest by a bi-partisan love fest. At its highest level, politics is not the art of the possible. It is the alchemy that turns the impossible into the possible. If you've ever seen or experienced that transcendent level of politics, it changes you forever. I saw and felt that late yesterday sitting in my living room watching Rep. Nita Lowey and returned volunteer and journalist Maureen Orth talking with Chris Matthews on Hardball. Most people watching had no idea what an incredible moment this was. But I knew, and as I watched with tears in my eyes, my love of my country and my faith in democracy had never been so intense and profound. For the past few months, I have been involved with a small band of sisters and brothers leading tens of thousands in one of the most inspiring political dramas of our time. We are mainly among the 195,000 returned Peace Corps volunteers, and we have been working ceaselessly to see that President Obama keeps his campaign pledge to double the size of the Peace Corps and to build a bold new Obama Peace Corps. For reasons I will never understand the president has walked away from his fervent pledge, and in his administration's budget given the agency $373 million, enough for neither reform nor growth. That has only vitalized us. We have been pushing for the $450 million that would allow this magnificent journey to an enlarged, emboldened agency to begin, sending volunteers to the remote island of Indonesia, and one hopes back to the villages of India where once volunteers trod the pathways. We have been pushing for the $450 million that would permit the agency to reform, to build innovative new programs that help the peoples of the world in crucial new ways with technology, health and education. Of course, this is impossible. Obama is a popular president and who would stand up against his budget? We're asking for an enormous increase when nobody is getting anything like that. As for many of the hapless bureaucrats in the Peace Corps office, they don't want money that would force them to change and to work late. Led by Rajeev Goyal, the National Coordinator of http://www.morepeacecorps.org, we have set out to create such pressure that the Peace Corps will get the money that is so desperately needed to help to change our world. We are employing neither money nor professional lobbyists only the glorious freedom of our democracy, citizens petitioning their elected officials. As Chairwoman of the House State and Foreign Operations Subcommittee, Lowey oversees the $49 billion Foreign Operations Appropriations Bill that contains money for the Peace Corps. With one word she has the power to give the Peace Corps $450 million but to do so she must cut funds for something else. It's an enormous thing to ask her to add $77 million to the Peace Corps budget. Enormous. Last week we gave Lowey a professional printed book titled We Implore You, Chairwoman Lowey containing letters to the New York representative from Peace Corps volunteers and others. We worked to get scores of her constituents to call her. We pleaded for important figures to talk to the elected official and make the case for the $450 million. We created extraordinary pressure but that by itself would not have achieved our goal. It was the force of so many people across America that allowed two members of the House, Sam Farr and Betty McCollum, to attempt to turn our earnest entreaties into legislation. Farr and McCollum used every bit of clout and capital they had. Farr's legislative aide, Marc Hanson, a returned volunteer, worked endlessly. I'd get emails from him at 11 at night. McCollum's chief of staff, Bill Harper, another RPCV, worked just as hard. There is a Republican on this list too, Rep. Mark Steven Kirk. Kirk has served in Afghanistan, Iraq, Haiti and Bosnia. He is an articulate supporter of an expanded Peace Corps, and one of the most thoughtful members of the House. You and I will never know all the machinations and entreaties, all the phone calls and negotiations. They have done their work magnificently. They are the true heroes of this drama. And so yesterday afternoon on Hardball, Lowey said that the Peace Corps would get the full $450 million. There then for a precious moment was the alchemy of the impossible transformed into the possible. This morning in the markup of the bill, Lowey kept her word and she too deserves great credit for political courage. This was done in a tiny room in the Capitol, and I could not get in. But former Senator Harris Wofford has privileges and he was there. "Before Lowey started the meeting I thanked her warmly and she enthusiastically talked about her support of the Peace Corps over the years," Wofford emailed me. "Then in the markup she made the case for the $450 million on the way to doubling the PC; the ranking Republican member Kay Granger of Texas graciously supported the whole bill and included endorsement of the funds for the Peace Corps and senior Republican Rep. from Calif., Jerry Lewis spoke about his long support and how once he invited PC Director Loret Miller Ruppe to bring him a plan to double the Peace Corps. It was a love fest meeting." It was not only a love fest by a bi-partisan love fest. Soon the battle moves to the Senate with an enlarged, inspired, impassioned movement that will fight even harder to hold onto this amount, seeking not just more money but true reform, and a Peace Corps worthy of our age. 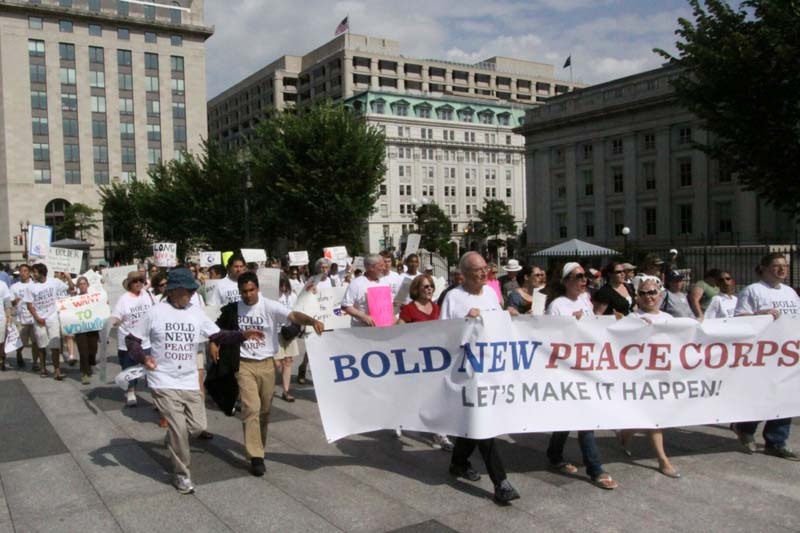 Last Saturday we had a rally at Freedom Plaza two blocks from the White House. Afterwards, we marched to 1600 Pennsylvania Avenue led by Tim Shriver, the son of the Peace Corps founder, and we stood and we shouted. 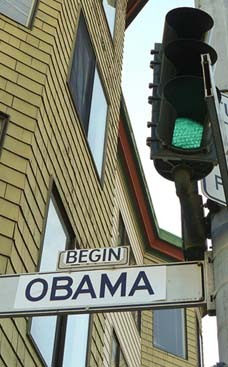 One day Obama will hear us, and when he does, he will thank us for being true to his vision.